Betty was an attraction at the 1939 New York World's Fair with the "John Hix Strange as it Seems" sideshow. Although Betty opened with the show, a letter from the John Hix management indicated that she would not be continuing as an attraction after mid-July 1939. 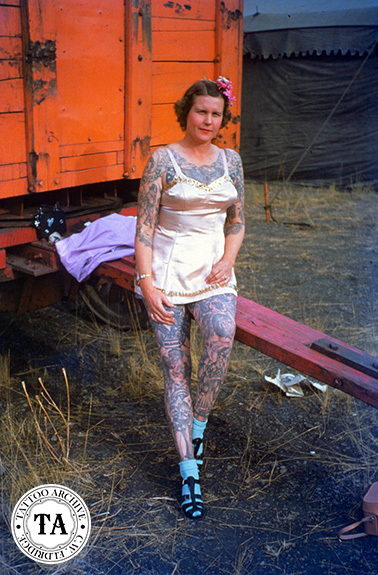 In a 1981 interview with the Tattoo Archive, Betty recalled many fond memories of those days. Betty described the set-up of the show as being in a very large building with 22 stages arranged in the shape of a horseshoe. All the stages were lit and had electric curtains. Four uniformed lecturers moved from stage to stage and introduced the attractions. Betty's major complaint about working with the Hix show was that they took the rights to the picture concession. Perhaps in an attempt to make up for the lost income, management paid higher salaries. Working with all the major shows of the era, including: Ringling Bros.& Barnum & Bailey, Cole Bros., Sells-Floto, etc., Betty left the side show platform for a few years and worked as a rider in Harry Carey's Wild West Show. During the off-season she could often be found in San Francisco tattooing at one of the many arcades. Betty retired from the circus world in 1967 and settled in central Florida, near Tampa. In 1981 she became the first person to be honored by the Tattoo Hall of Fame. Commenting on her retirement, she said, "Boy, do I miss the people and the travel." Betty died in her sleep in 1983, but we hope this award will help her memory live on. Interested in reading more about Betty? Look for The Life & Times: Betty Broadbent in our online store.